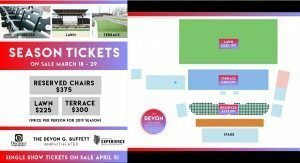 Season tickets will be on sale for the 2019 season at The Devon G. Buffett Amphitheater for a limited time from Monday, March 18th at 10 a.m. until Friday, March 29th at 5:00 p.m. Season tickets include the full season of at least 22 shows produced by The Devon including headliner acts .38 Special, Wynonna Judd, Leonid & Friends and Brian McKnight, plus $5 Friday Series, Tribute Series and a Christian Day featuring Jordan Feliz. Additional headliners will also be announced as they are confirmed. Season tickets can be purchased in three seating levels of the venue including: reserved seating level for $375 per person, general admission terrace level for $300 per person and general admission lawn level for $225 per person. Additional ticket processing fees will be applied at the time of purchase. Season tickets will be available by calling the Decatur Park District office at 217-422-5911 or in person at 620 East Riverside Avenue from 8 a.m. – 5 p.m. Monday thru Friday. Single show tickets will go on sale April 5th and can be purchased online at www.devonamp.eventbrite.com.